OK, so there's lots of info out there about a show at Brandeis on April 1, 1997 -- some recollections, even some actual concert posters for the show (referring to Atari Teenage Riot & The Cardigans as openers). But then there's also this date, which seems to be backed by Sloan's recollection of the show below, as well as the ticket below. I was baffled, but it appears that a giant blizzard on April 1 ended up postponing the show until today. The recording has a DJ intro and then a little Beck voiceover before getting into it. It only includes from "Allegretto" to "High 5" listed below. The tracks on the recording are not entirely in order of how they were actually performed. We also have other songs listed for the setlist that are not on the recording, and I have no recollection how they got there. "Whiskeyclone", really?! The next day we hit Boston. Upon arriving we embarked on a wild goose chase through the airport's various terminals looking for our rental van, Andrew's return ticket for that night, the road to the highway to the turn off to the road to the campus to the hall where the Beck loaders awaited. Of course we wasted about an hour getting the van, and nearly another trying to find where Andrew's homebound ticket was. The highway situation took care of another hour and a half, as we were smack dab in the middle of Friday evening traffic. We arrived at the venue with less than hour to spare. Luckily we tend to rent, rather than bring, our gear for US shows, so it was all there waiting for us. As was Beck's road crew...who ended up being very cool. 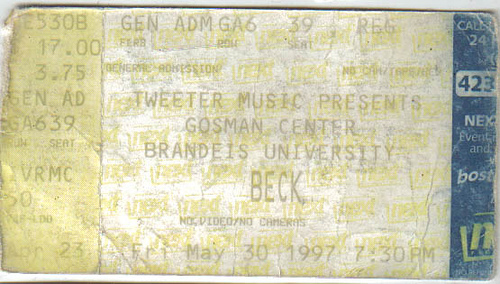 Beck, it seems, had lifted them from Sonic Youth, and you could feel a certain amount of "ready for anything/ seen everything" calmness about the whole operation. They said that they would hold the doors while we checked, which they didn't end up having to do. We even got our own monitor mixes, which is almost unheard of on big tours like that. Usually I get stuck with the deaf keyboard player's mix, all high end and TV signals. The venue was an immense gymnasium, holding a sold out seven thousand hacky-sack-mad kids. It had a sky-light that I thought was cool, until I realized that we were going on before sun down. In daylight. Inside. We had a Fender Rhodes piano, so Andrew did his usual "jam" before we went on. Seven thousand people there, in total day light, and we went on forgetting that none have them had ever heard of us. They soon reminded us. It was fun for a few songs, but then the entire audience turned and stared somewhere to their left, toward and past me. It was Beck, up on the balcony trying to watch us undercover. That was the gist of the whole show, "where's Beck??" which is always a danger when opening for a big name act. We didn't go down great or horribly. We didn't really go anywhere. But we talked to Beck before he went on and he was quite nice, if really shy, and obviously exhausted. I got the feeling that he was really burned out from working so much. His bassist, Justin, was very cool. He used to play in Medicine, and is a fan. He stood with Sandra on the side of the stage by me, and she said that he was freaking out during every song. He was telling us about the tour during dinner. He said that they had two buses, which I had noticed at the Detroit show, and 23 people on the road. It was a huge production, semis and everything. But it paid off. I thought that the Boston show was one of the best I've seen in years, I was really impressed. Justin said that they were actually making money on the road despite the production costs. That is rare, especially for a band that is really still on the fringe in many respects. Beck has won a Grammy and sold platinum, obviously a star, but in terms of today's live market, most bands are tour support victims. This was meant as a stand alone show to be aired, so that's how I kept it. I deleted some of the banter in the middle, and tracked it together, the only odd part is when Beck starts talking about how he named 'Odelay.' At the end of the show, the DJ erroneously states the show was March 30th, when in reality according to Beck.com it was May 30. The original CD was four tracks, I split them up to make one continuous show (songs 01-06, 07-08, 09, 10 each had their own tracks). These same performances of 'Where It's At' and 'High 5' are also included on Media America's SonicNet All Access show #98-51.